Non-irritating, Smooth Toe Seam: Flat, soft, low-profile toe seam reduces pressure and irritation on toes. Extra padding in the Foot, Heel, Toe: Reduces friction and provides extra comfort and protection. Acrylic Multi-Fiber Yarns: Wick away moisture to keep feet comfortable and dry. 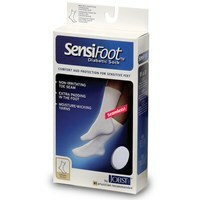 Antibacterial, Antifungal Finish: Inhibits growth of bacteria and fungi on the sock to help prevent odor. Non-Constricting, Mild Compression: Helps keep the sock in place to prevent sliding and bunching. This product is Latex free.